Sublimation Printing: This is a special form of digital print that wears considerably better than normal transfers. It is similarly applied using a heat press, but is only successful when used on white polyester. Heat Set: Computer cut vinyl which is heat applied to the garment/bag etc. This method is ideal for individual names and numbering of sports uniforms, Leavers hoodies or any other personalization. Buy our garments or supply your own. We have distributorships and agencies for a huge range of products suitable for embellishment with our artwork services. 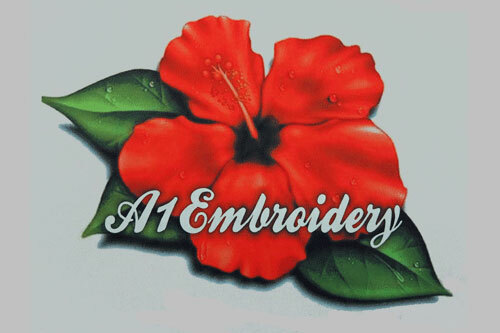 However you are always welcome to supply your own pieces of clothing, towels, fabric bags, table cloths, aprons or whatever else is suitable for embroidered or printed decoration. As long as our equipment doesn’t object, we won’t either. The apparel in our showroom provides what we consider the optimum range for quality embellishment. But it’s not just there to be adorned. If you see something you like on or shop floor and don’t require a logo, pattern or brand added, it’s available as at any retail outlet. Our stocks are limited by design, but if we don’t have your colour or size, we’ll get it in for you.